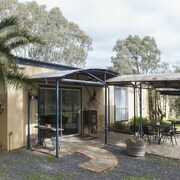 This property is a secret gem hidden in Stawell. 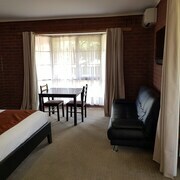 Rooms are spacious and very clean, soft beddings, quiet surroundings. My family and I had a very comfortable stay. Highly recommended. Just very cosy. Good beds. Fridge and microwave. Clean. Which hotels are closest to the Ararat airport? 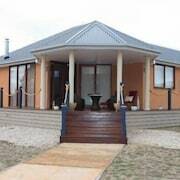 Where to stay near top Ararat attractions? What kind of hotels are in Ararat? 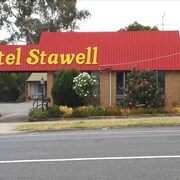 Which hotel chains are in Ararat? Visitors can enjoy all that Ararat has to offer including the seafood restaurants, golf courses, and mountain views. This city also attracts tourists with its welcoming locals. In Ararat, there are 5 hotels and other accommodations to choose from. 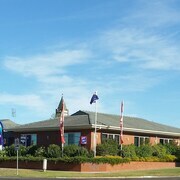 Favorite places to visit in the city include Ararat Racecourse, Alexandra Gardens Park, and Ararat Former Town Hall. A couple of additional sights to add to your agenda are Gum San Chinese Heritage Center and Chalambar Golf Club. Pyrenees Holiday and Caravan Park - With a stay at this 3.5-star cabin, guests can enjoy access to free parking and laundry facilities, along with an in-room kitchenette. It's a favorite with Expedia travelers for its overall value and helpful staff. 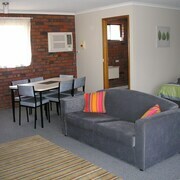 Ararat Motor Inn - Our customers like the helpful staff and comfortable rooms at this motel. Amenities in this 4-star motel room include free WiFi and cable TV. Econo Lodge Statesman Ararat - This 3.5-star motel features a restaurant, free parking, and a bar. Situated in southwest Victoria, about 150 km north of the coast and 200 km northwest of Melbourne, is the mountainous area of Ararat. The Western and Pyrenees Highways intersect near the city’s namesake hills, while Cemetery Creek meanders through town. 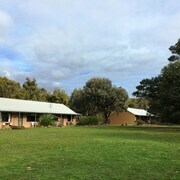 Notable attractions in and around Ararat include the Gum Sam Chinese Heritage Centre, the Langi Morgala Museum, and Astor Cinema. Then there are Aradale Lunatic Asylum Tours, which offer a peek into the region’s past. 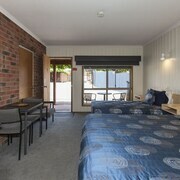 And by booking a room at any of the hotels in Ararat, you can experience the best of what this town has to offer. 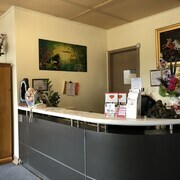 Regardless of whether you’d rather spend your nights at one of VIC’s plush resorts, or at any of the more affordable Ararat motels, you’ll have no problem finding the ideal spot to rest your head. 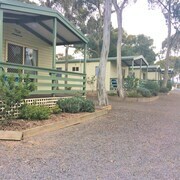 A variety of lodging options await your arrival in Ararat, mostly along Barkly Street near the centre of all the action. 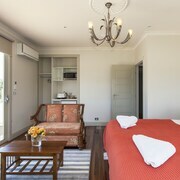 Those interested in enjoying more peace and quiet, however, can head off the main drag and find sleepier accommodation. Many visitors to Ararat arrive by way of the airports in Melbourne and Avalon, each about 200 km away. If you plan on taking one of the Melbourne flights, you can arrange a car hire from the airport and drive into town yourself. Most travellers tend to get around by car, as the streets are organised in a grid and very easy to navigate. Otherwise, hop on any of the local bus lines that offer rides throughout the region, or take either the Ballarat or Overland train lines that pass through Ararat and head as far as Adelaide and Melbourne. Are you ready to book your trip to Ararat? 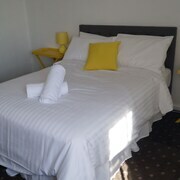 If so, count on Expedia.com.au to help you score the web’s best deals on cheap rooms and resorts. Our intuitive search engine makes it easy to book Ararat hotels in an instant. 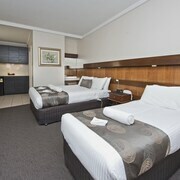 We even have deals on Melbourne holidays if you’d rather stay somewhere more metropolitan while in Victoria. So why wait another minute? Start your search today and you’ll be on your way to Ararat before you know it. 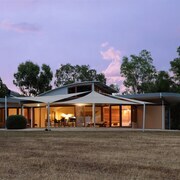 What are the most popular hotels in Ararat? 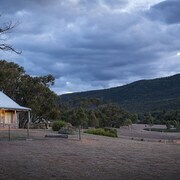 Are there hotels in cities near Ararat? 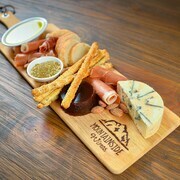 Explore Ararat with Expedia.com.au’s Travel Guides to find the best flights, cars, holiday packages and more!